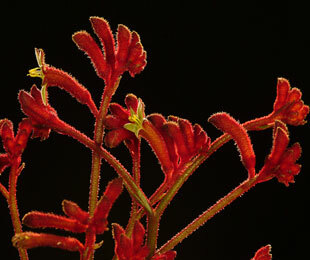 Description: Ruby Velvet™ Anigozanthos is a smaller Kangaroo Paw with clean, compact foliage that reaches 30cm – 40cm. 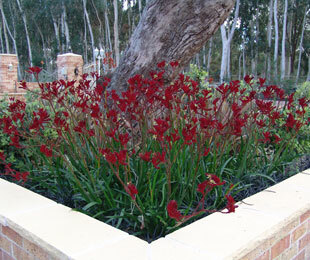 It has an abundance of bold red flowers that reach to 70cm – 80cm high. Size: 40cm high x 30cm wide. Uses: Feature pots and low maintenance gardens. 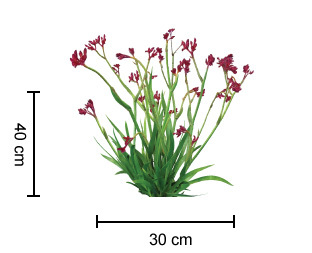 For lowest maintenance it is best planted behind/in between evergreen strappy leaf plants. For more detailed information on Ruby Velvet™ click here.